This recipe features Dillon’s Small Batch Distillers, a local small batch distillery producing vodka, gin, rye, whiskey, and bitters. Dillon’s is pretty great, especially for those with celiac disease who are wary about using alcohol that is derived from wheat or barley. This is because it uses distilled Niagara grapes to make their vodka and gin–the former being the base of their fruit/herb/floral-infused bitters. Just step away from the rye and whiskey. But drinks aside, bitters are great for cooking and baking, too. Preheat the oven to 425°F. 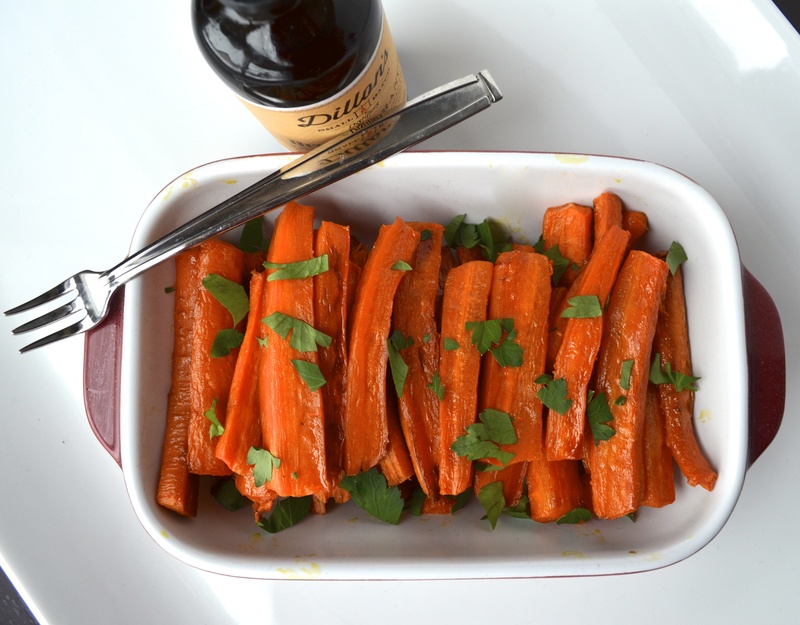 Toss the carrots with the olive oil, then spread in a single layer on a baking sheet. Sprinkle with salt and pepper. Bake for 15 minutes. Whisk together the maple syrup and Bitter Orange. Drizzle the mixture over the par-baked carrots, mixing to combine. Return to the oven and bake for 15 to 20 minutes, until tender and starting to caramelize. Sprinkle with parsley. Serve warm.